A lot of our articles talk about animals that people don’t see frequently, to increase interest in the world that lives right outside our sight. This is not one of those articles, but is instead an article about an animal that is omnipresent and seemingly uninteresting, the pigeon. The pigeon family (Columbidae) includes 310 species, ranging from the size of a sparrow to the size of a turkey. The only places on earth that do not have at least one species of pigeon are Antarctica, the Upper Arctic, and the most desolate regions in the Sahara Desert. The words pigeon and dove are unscientific in nature, and in general pigeons that are mostly to entirely white are called doves, but they can be used interchangeably. The pigeons we see every day here in California cities are actually a subspecies of the rock dove. They are called feral pigeons, because they were actually reintroduced, from humanity’s domesticated pigeon populations. 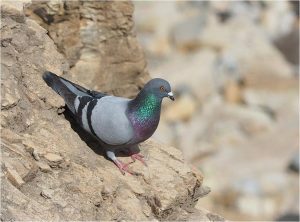 Pigeons were the first bird humans ever domesticated some 10,000 years ago in ancient mesopotamia. 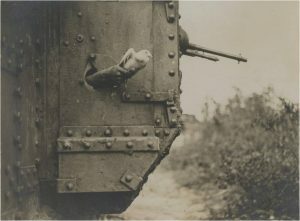 Most people are at least vaguely aware of the benefits pigeons have provided, especially as messengers during times of war, but they were also domesticated for various entertainment purposes (racing, trick/tumbling) as well as food (commonly called squab). One of the amazing things about pigeons is their homing ability. They can find their way home upon release at places they have never been to, up to 1300 miles away from their home roost. This ability is poorly understood, and because pigeons aren’t a migratory species it is especially unusual. There are many theories, the main ones being that pigeons share traits of migratory species, namely the ability to sense the earth’s magnetic field to learn its location and fly on a compass bearing. Alternatively they could be using the sun’s position and an internal clock to navigate. 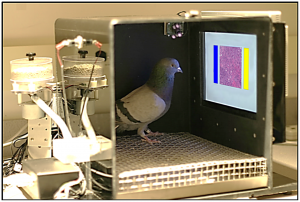 However when scientists tested both of these theories, using magnetic disruption and internal clock disruption respectively, they found that pigeons got home perfectly fine without either. This caused a plethora of alternative theories, which despite not yet being properly studied are still interesting nonetheless. Star navigation, landmark navigation, smell-based navigation, infrasound mapping, and polarized light navigation have all been suggested. Pigeons are often studied for their above average cognitive abilities. They have been shown to be able to tell the difference between different art styles, recognize and differentiate written words, and can even be trained to differentiate benign and malignant tumors in photos correctly 85% of the time, and are one of only two birds that can recognize themselves in mirrors and videos/images (along with the Eurasian Magpie). So next time you see a pigeon on the street, maybe you’ll take a second to think about all the amazing things those little birds have accomplished.